Making a dramatic entrance in her signature hue, Janelle Monae attended the Kawakubo Comme des Garcons-Art of the In-Between 2017 MET Costume Institute Gala this evening(May 1st) at the Metropolitan Museum Of Art in New York. 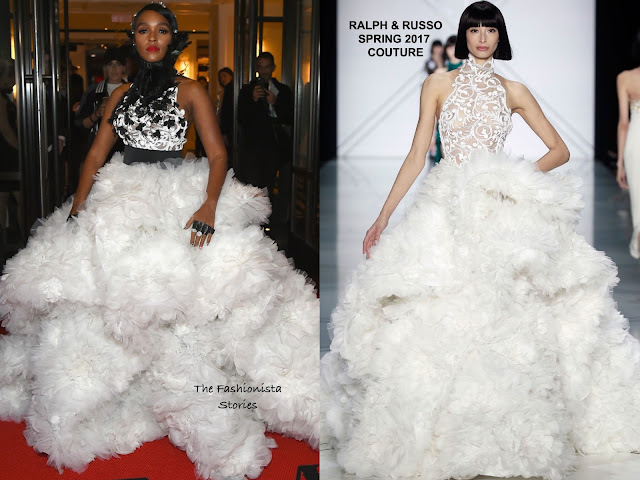 She hit the red carpet in a RALPH & RUSSO SPRING 2017 COUTURE halter gown with a white & black lace embroidered & feathered high neck top and a white tulle layered ball gown skirt with a black waistband. The top of Janelle's gown is modified from the runway version which worked in her favor. Love this look head to toe which was topped off with a flawless beauty look and TIFFANY & CO jewelry. Tags: fashion, Janelle Monae, Ralph and Russo, Tiffany and Co.